The recent tsunami in Indonesia which left more than 400 dead and several injured has also severely affected the wildlife in region including land and sea animals. 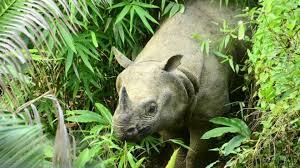 Conservationists were worried about the last flock of 70 odd Javan rhinos which live in Ujung Kulon National park region that is close to volcano but luckily all of them are alive. The park’s chief Mamat Rahmat stated that this disaster has made it imperative to shift the endangered rhinos to a safer place as there is eminent danger of another tsunami soon in the region due to volcanic action. Conservationists have been looking for safe habitats for the wild Java rhino for nearly eight years without success as they say that these animals need appropriate climate, habitat, adequate water sources and safety from poachers as a key criterion for survival. Their current sanctuary has 5100 hectares of beautiful and undisturbed rainforest that has several freshwater streams to keep them well fed. The deadly tsunami occurred due to eruption of Anak Krakatau volcano located in the western strip of Java and Sumatra islands which led to massive landslide in the Sunda Strait. The Java rhinos are vulnerable to diseases from domestic livestock like cows, pigs and also native wildlife in the region of Ujong Kulon so it is very difficult to find a safe habitat for them. The volcano could be viewed from the national park and it caused a massive tsunami that crashed closed to the national park and killed two park officials and also damaged office posts. After the tsunami a team had been sent to access if all the animals were safe and found some of them at a hilly region in the park’s northern side. Wildlife expert at WWF Indonesia has said that in view of the danger facing these animals it is best to prepare an alternative site for housing them.